Max and Amy need your help to rack up the most extreme score possible in the best new free endless running game! Set some intense high scores and beat your buddies in the rush to the top! 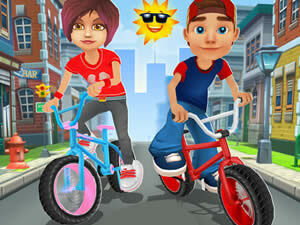 Whether you are a boy or a girl, there are lots of funky characters to meet and lots of shiny cool bikes to earn! Collect coins, complete missions, speed through the ranks and more!